ITALY: March 30 - April 9, 2019 "Paul's Response to the Pagan World" (Program # 190303) — Christian Travel Study Programs, Inc. Depart US from international gateway for Rome, Italy. The CTSP arranged group flight is scheduled to depart from SEA and there will be a transfer bus for the group upon arrival on the 31st. For those on this group flight, meals and overnight: In flight. (**Since we know that some participants have purchased a "land only" package, we need to offer a further word of assistance. If you have decided to obtain your own flights, these should arrive on Mar 31, 2019, any time during the day. Our program begins with dinner on Mar 31, and touring begins on Apr 1 with Ostia, returning to the Golden Tulip for the second night. Upon arrival, transfer to your hotel for some rest, a nice dinner and a good night's sleep. Dinner will be served at your hotel. Overnight: Golden Tulip Isola Sacra (1 of 2 nights). Day Three. Monday, April 1, 2019: What it meant to be a Roman. Rome was a city, an Empire and an ideology. Today we will examine how government, goods, services and transport held a sprawling empire together. 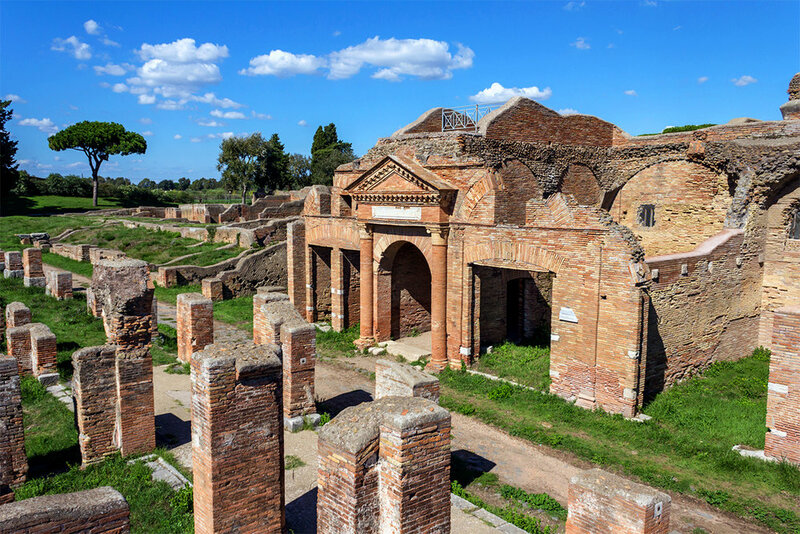 (Sites: Ostia Antica). Overnight: Golden Tulip Isola Sacra (2nd of 2 nights). Day Four. Tuesday, April 2, 2019:Roman Power and the New Testament. Day Five: Wednesday, April 3, 2019: Paul and His Epistles. Today we will examine what forged the identity of a Roman and compare how Paul both identified and used those methods of unification to build God’s people into the body of Christ in his Epistles. The setting will help us understand “street scenes” that became motifs of his epistles. Our goal is to uncover the challenge of the Gospel as it moved into the pagan world. Sites will include Herculaneum and Pompeii. Overnight: Sorrento (1 of 2). Day Six. Thursday, April 4, 2019: Free Day in Sorrento. Today is a day at leisure, where you are on your own. You will wake up to one of the most beautiful "world class" cities in Europe, perched high above the water of the Bay of Naples. You can walk through the vendor streets of the old town, opt to take a high speed ferry over to the island of Capri, or even arrange an excursion to the Amalfi coast through a local agency. Tonight we will enjoy an included dinner theatre with good food, lots of music and a fun time (conditions permitting). Overnight: Sorrento (2 of 2). Day Seven. Friday, April 5: The Great Transformation. Day Eight. Saturday, April 6, 2019: A Spectacular Civilization. Day Nine. Sunday, April 7,2019: Paul's Two Visits in Rome. Group flight will depart FCO to the US. (At this time, the group booking we are holding departs on AA111 at 11:05a via ORD AA1485, arriving SEA at 8:36p the same day). For participants who purchased their own air tickets, arrange your flights should depart after 11:00a if you would like to utilize the CTSP transfer to the airport. The group flight will be arriving later the same day. Should you book a later flight (and not choose to use our transfer), the Leonardo Express train is a 5 minute walk from our hotel, and costs (at the time of this posting)14 euros. *Every effort will be made to complete the full itinerary. Yet, because conditions are often unpredictable in travel, we reserve the right to make changes during the tour. FULL TOUR PRICE OF $4479 (Mar 30-Apr 9, 2019 … 11-days) INCLUDES air from Seattle, group transfers in Italy, hotels with breakfast, six (6) dinners, tips for group services, full sightseeing, the services of an English-speaking lecturer, resource notebook, local guide (where required) and entrance fees to sites/activities as listed in the program. All taxes and surcharges in effect as of June 1, 2018 are included. If additional surcharges or taxes are imposed by the airlines or governments, any additional amounts will be the responsibility of the passenger. A surcharge will be the responsbility of the passenger if the euro vs dollar rate exceeds 1.3. This program price is based on a minimum of 20 participants. LAND ONLY PRICE of $3379 INCLUDES all of the above except airfare and airport transfers. YOUR ACCOMMODATIONS in 4* hotels (plus a mansio) have been chosen for your enjoyment. The double occupancy rooms are twin-bedded with private bath. Individuals enrolling without a roommate may request to be assigned one, or, if not available, individuals will be subject to the $450 single supplement charge. There is limited availability for single rooms and they are usuallly smaller than normal twin rooms. PAYMENT: A nonrefundable deposit of $300 per person, is required to secure your place on the program. (Deposit may be refunded only if CTSP withdraws the offer of the program.) A second payment of $2000 is due Sep 28, 2018. Final payment is due to CTSP by Dec 28, 2018. Thereafter, a late payment fee of $100 per person per month, plus any airfare increase will be assessed. Please be aware that registered guests may not “transfer” their registration to others in lieu of cancellation. ITINERARY LENGTH: Flight times are subject to change without advance notice. CTSP is not responsible for changes and delays in airline schedules and does not reimburse passengers for expenses resulting from delays. Because airlines often change flight times and dates at the last minute, CTSP strongly recommends the purchase of any connecting tickets which can be changed without heavy fees and penalties. If airline(s) change flight schedules, CTSP reserves the right to lengthen or shorten the itinerary accordingly, and whenever possible, you will be notified in writing. If changes necessitate extra overnights, you will be charged (per night) US$140 double occupancy, or single rooms US$210 for BB.